In Simon Dewey’s painting Lead Kindly Light, we see the Savior holding up a light along a darkened path. 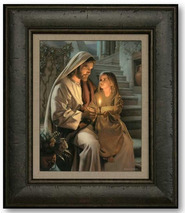 While there are many beautiful representations of the Savior as our light, this painting proves simple and poignant. 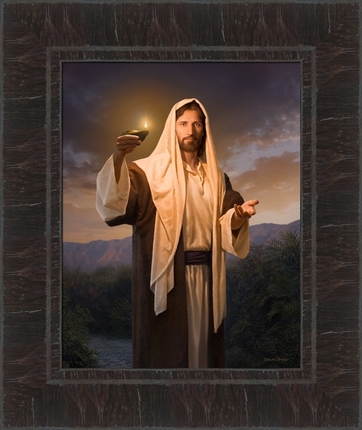 Spiritually uplift your home with this stunning piece of artwork, a perfect gift for every occasion. 17x20 framed canvas. This painting perfectly portrays our Savior saying "Come, follow me". I saw this painting before Christmas and absolutely Loved it. It captured my attention immediately. I then showed it to my husband and he was very willing to allow me to purchase it for our home. Before it arrived, my husband talked of putting up special lights to shine on it and give it the attention it deserves. But, once it arrived, it was obvious that no lights were needed. The way Simon Dewey painted the lighting into this picture, it glows on it's own, drawing you in, no matter where you look at the it from. You can see as well as feel the Savior asking you, to "Come, follow me." 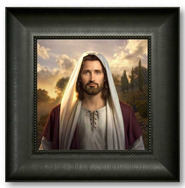 I saw this picture in an LDS bookstore,and it literally took my breath away! I showed it to my husband and he loved it just as much. It actually brought me to tears in the store. Looking at it, it felt like the Savior was inviting me to follow him. I love Simeon Dewey's work, but this has to be my favorite. The way he painted the light in this picture is amazing! We had to have it. It now hangs in our home where I can enjoy it's beauty every day!